Ami was one of the most arrogant fairies in Fairy Realm. She would break all the rules, and did not listen to Tila, the Flower Fairy. Tila was upset about this. She sent Ami to the Underworld Fairy Realm, a cold dark place filled with scary creatures. Over time, the gothic Underworld Fairy Realm transformed Ami, and she grew to love the darkness. Ami had become a Goth Fairy. Tila, the Flower Fairy, invited Ami back to the Fairy Realm one year later. Ami politely refused, because she now loved the Underworld Fairy Realm. But she did agree to come and visit her friends for one day of fun and games. 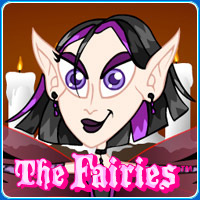 Help Ami dress up in her most fashionable gothic clothes before visiting Tila's Fairy Realm.